Lyft shares dropped to fair value, judged by looking at comparable companies. The lack of a pop means there is not an inflated valuation to tempt venture investors during lockup. Reiterating my buy and price target. Lyft (LYFT) shares have slid significantly since it IPO'd on the Nasdaq on Friday, March 29th, 2019. Despite the listing becoming over-subscribed in the first two days of the company's roadshow and appreciating 20% prior to opening to the public for trade, shares immediately and sharply slid as retail investors rejected the high valuations. Commentators have blamed Morgan Stanley (MS) being inexperienced in the space of tech IPOs, which are largely under a JP Morgan (JPM) and Goldman Sach's (GS) reign of a duopoly. Others have blamed the company's lack of profits, Warren Buffet's negative remarks on IPO investing, and managers receiving share allocations feeling emboldened to sell by the delay in reporting to the syndicates (keeping them in good favor going into the next IPOs). Regardless of what caused this, I think this makes Lyft a highly attractive buy. 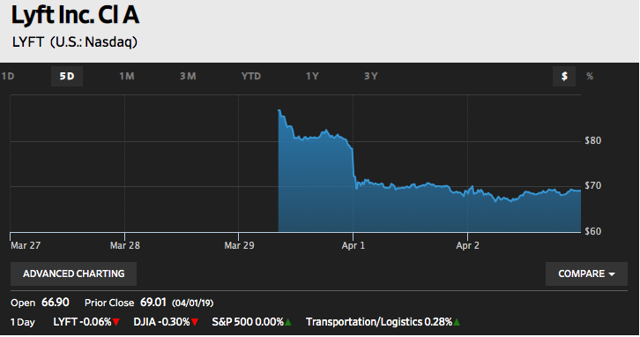 The drop in Lyft brought the stock down to levels where the underwriting syndicate had initially priced the stock, which is a 9x revenue per share multiple, justified by observing peers. The support level that seemed to form at the $68 dollar level seems to validate this metric as a measure of fair valuation. Given my projections, this price level gives me a FY '19 price target of $103.91, which I'll round up to $105.00. For this reason, I am reiterating this as a buy for the long-term. Disclosure: I am/we are long LYFT.